Making a documentary is much more than simply filming what surrounds us. It can be a way of understanding the world, a tool to make it a better place, and an art form where you can find and express your own voice. This intensive, inspiring lab is designed to introduce participants to the engrossing world of documentary filmmaking. During this workshop, filmmakers will gain first-hand experience working alongside Oscar-Nominated documentarian Rithy Panh. The world-renowned storyteller will teach participants his method of narration through working with memory, culture, and identity to gain an in-depth understanding of personal traditions, celebrations, community, and the oral history of a country. His teaching techniques build on the foundations of cultural memory to capture fragile moments through film. Participants will be encouraged to find their own narratives that explore the idea of identity and origins by truly living, working, and breathing with their subjects. In small teams, students will make short documentaries from initial concept to final product during two lab sessions. The first session, lasting 3-weeks, will focus on development and pre-production, and the second 4-week session will entail production, editing and post-production. By the end of the programme, participants will experience the entire process of making a film. Experienced professional mentors will guide participants throughout the filmmaking process, and participants admitted in the program must commit to participating in both sessions. The goal of the lab is to provide new skills, to discover cinematic language, and to transform students into filmmakers who are ready to change the world and tell their stories. Please note that participants are expected to attend both sessions, and should apply before the deadline. Timings will be determined based on the availability of accepted applicants, however, participants must be able to commit at least five hours per day. Proposed timings are 5-10 PM daily on weekdays, full days on weekends. Full commitment may be required during production and post-production, depending on the project. Applicants should demonstrate some experience in filming and storytelling. Looking inside yourself: what do you want to talk about? Exercise: make a 3-to-5-minute film without editing (the subject will be assigned). Formation of production teams. Each participant will work in the team of at least one project as the director, producer, sound recordist, or camera person. By the end of the course, students will have created three to five documentary short films, which are screened for the class. As a group, we prepare distribution strategies. Then, based on their personal experience, each student proposes a new idea for another documentary. The lab ends imagining new films and defining the personal style of each student. “The essential is always threatened by the insignificant,” wrote the poet René Char. In this new era of globalisation, his sentiment now seems to resonate with even more depth. The endless flow of information made possible by digital media brings with it countless benefits, but also contains many irrelevant distractions. Society is changing rapidly; views are changing, and economic development is accelerating. For centuries, since the drawings of the cave of Lescot, humanity has experienced art in two dimensions. Now mankind is entering the epoch of virtual reality, but what do we do with this new and powerful technology? How can we integrate this medium into our art without losing our roots and identity? It is on this reflection that the workshop will be built so that each participant not only discovers the relevant digital techniques, but also learns how to question their narrative in order to stay true to their content. Applicants should submit a proposal of no longer than one page for a short documentary film (maximum duration 10 minutes). This proposal can be a simple idea or a theme; it must show the personal resonance and motivation of the student. Projects that have already been developed or filmed are not eligible. Applicants should provide the reasons they want to make the proposed film, and explain why they are the right person to tell the story they have chosen. Selected applicants are welcome to change their idea during the lab—we understand that projects often evolve drastically during the development process. Please note that submission of materials does not guarantee admission. Applicants will be notified of their acceptance status in a timely manner after the submission deadline passes. This programme is open to citizens and residents of Qatar- applicants are requested to attach a copy of their Qatar ID to their submission. Candidates whose work shows promise will be shortlisted. Shortlisted candidates will be invited for an interview with the Institute and the lead lab mentor. The importance of participation in this class cannot be overstated. Students should be prepared for every class and should always have their materials with them for presentation, discussion and in-class workshops, and should be prepared to contribute ideas or ask questions in every session. They should demonstrate the self-discipline, commitment and respect toward others that is necessary for successful creative explorations and film production within a team. They should show initiative, take responsibility for their own work, and be able to solve problems when plans do not turn out as expected. 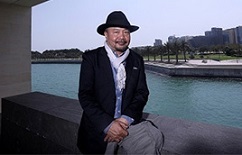 Rithy Panh is a Cambodian-French filmmaker, writer and producer. Born in Cambodia, he studied filmmaking at the Institut des Hautes Études Cinematographiques in France. His work focuses primarily on the genocide committed by the Khmer Rouge regime in his homeland. Rooted in first-hand experience, Panh’s works have a rare and striking authority. He then directed ‘France is our Mother Country’ (2014), ‘Exile’ (Cannes Film Festival 2016), and ‘Graves Without a Name’ (Venice, Telluride, and Toronto Film Festivals 2018). He is also a principal founder of the Cambodian Film Commission, an industry development organisation that includes the CFC Film Lab, a professional film training programme for Cambodians. Socheat Cheng holds a Bachelor Degree in Information Technology. During his studies, he was always passionate about filmmaking. After his graduation, he got involved in numerous activities in the film industry such as documentary and fiction filmmaking, editing, colour grading, cinematography, camera assistant and visual effects. In addition, he participated in a year-long documentary film training program initiated by Bophana Audiovisual Resource Center. He also worked with many foreign film crews and production companies from France, Korea, and the USA. 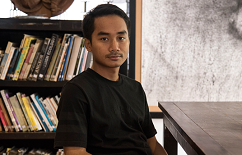 He recently became an assistant to Mr Rithy Panh and has helped make the films ‘The Missing Pictures’ (2013), ‘Exile’ (2016), ‘Bangskol: A Requiem for Cambodia’ (2017).